Many high quality and highly decorated arms are seen from time to time with the names “G. L. Rasch” and “C. W. Rasch” of “Braunschweig”. 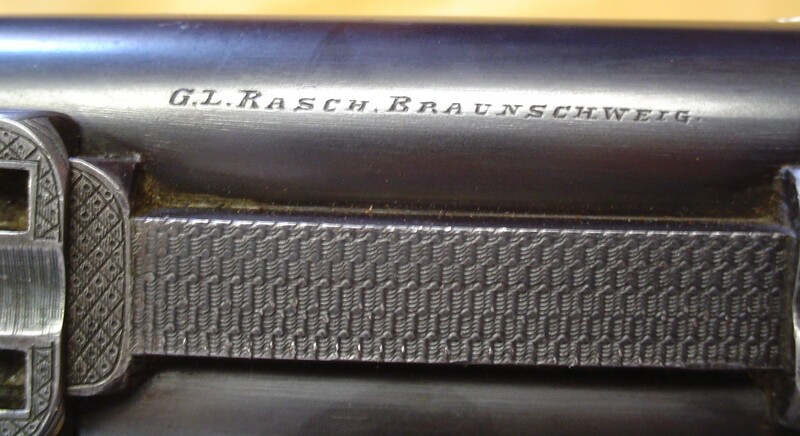 Often the owners ask who were the Rasch makers and when did they make these firearms. These are questions which may be difficult if not nearly impossible to answer due to reasons which will be elaborated upon. 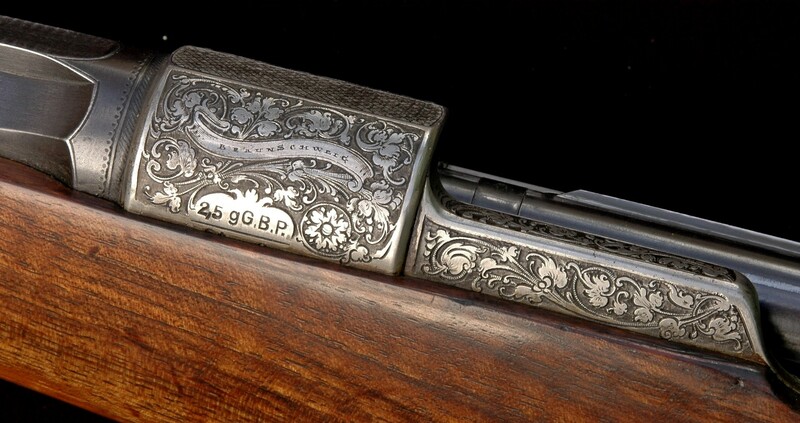 Very little is found in print about this prolific gunmaking family. Eugène Heer’s mammoth book DER NEUE STØCKEL has a list of ten members of this family with only birth and death dates. Some more information came from the book by Wolfgang Glage: Das Kunsthandwerk der Büchsenmacher im Land Braunschweig, Braunschweig 1983. Contact with Mr. Otto Ebert of Brunswick (the English version of the name Braunschweig) produced further information but the family history is still incomplete and will probably always remain so. On Oct. 14, 1944 233 RAF Bombers dropped 847 Tons of bombs on the old walled city center of Brunswick. The combination of 12,000 explosive bombs and 200,000 incendiary and phosphorus bombs created a firestorm that engulfed and consumed the old half timber frame buildings and threatened to suffocate all of the residents who had taken shelter in bunkers. It is unknown how many civilians lost their lives in the bombing but it is estimated that it may have been as high as 1,000. It was only through heroic efforts of firefighters that the citizens who had taken shelter in the bunkers did not perish. The firm G. L. Rasch had their store and shops at Bohlweg Strasse 50 in the old city center and it was totally and utterly destroyed in the bombing. Any records of the family, the firm and its history were lost forever. Heinrich Rasch I (1630-1674) came to Brunswick from Bohemia. He was listed as a gunsmith in the city files. Heinrich Rasch II (1676- June 8, 1732) He was listed in the city files as a master gunsmith. 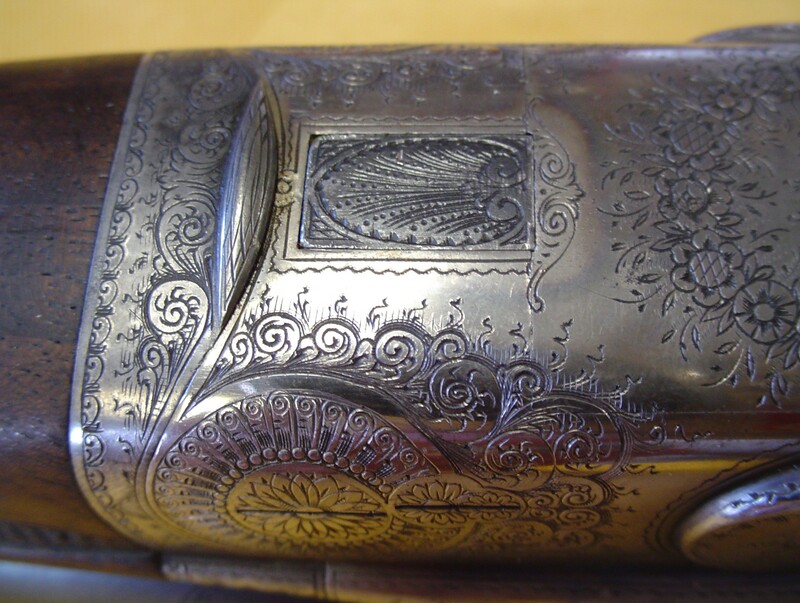 Hans Rasch II (1677- Oct. 10, 1719) like his father he was a master gunsmith. Johann Heinrich Rasch (Sept. 1, 1706- 1760) He was most likely the son of Heinrich II and was elected the Gun Makers Guild Director in 1745. Martin Heinrich Rasch (Sept. 29, 1743- Jan. 12, 1821) He was most likely the son of Johann Heinrich. Christof Werner Rasch (March 29, 1779- Aug. 6, 1827) He had his business at No. 6 Langer Hof. It is unknown what his relationship was to Georg Ludwig Martin Rasch but they definitely had separate businesses. Heinrich Ludwig Rasch who also had a shop on Langer Hof was no doubt a son who carried on the business after Christof’s death. (The percussion rifle marked “C.W.Rasch” pictured in this article was in my opinion made after Christof’s death). Georg Ludwig Martin Rasch (May 14, 1792- Jan. 29, 1867) He founded the business “G. L. Rasch- Braunschweig” in 1829 (an ad from the magazine Deutsche Jager Jeitung of June 14, 1891 gives a founding date of 1822) on Kuhstrasse but later moved to Bohlweg Strasse 50 where it remained until its destruction in 1944. He was the head of the Brunswick Gunmakers Guild from 1843-1845. 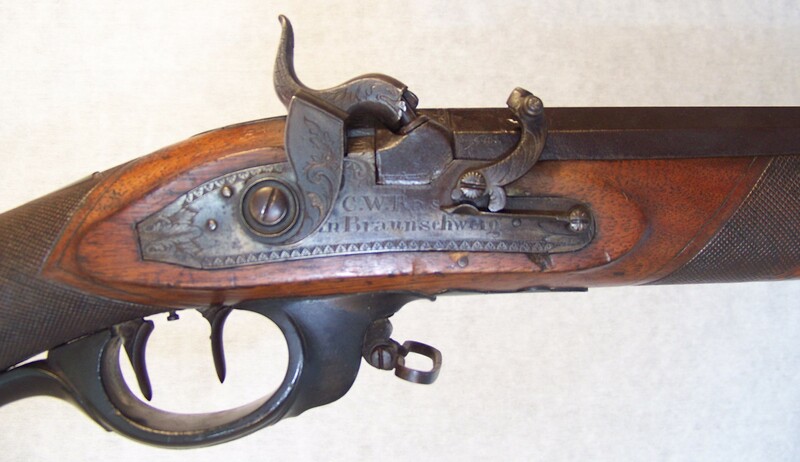 He was also the royal gunmaker to the Dukes of Brunswick which included Friedrich Wilhelm “The Black Duke” (1771-1815), Karl II (1804- 1830) and Wilhelm (1806- 1884). 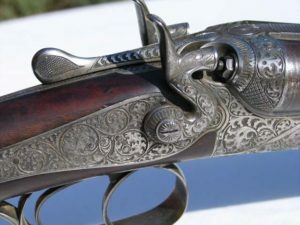 While the early guns marked G. L. Rasch were probably made by him, in his later years he may have started buying them from Liege, Belgium and Suhl and Zella-Mehlis. There is no doubt that the son or sons who took over the business after his death did so. Friedrich Martin Ferdinand Rasch was his son. Martin Ludwig Rasch (May 31, 1796- 1850) was Georg Ludwig’s brother and by at least 1836 a Master gunmaker. Heinrich Ludwig Rasch (June 12, 1818- Jan. 26, 1884) His address was on Langer Hof and no doubt was Christof ‘s son and carried on that business for some time after Christof’s death. He made the first 2 groove prototype barrels for the British Military Brunswick Rifle of 1836 designed by Captain (later Major) Carl Wilhelm Ernst Berner in 1832. He sold the business to Louis Bruns (May 25, 1843- June 27, 1908) in 1868. Friedrich Martin Ferdinand Rasch (Sept. 21, 1837- 1890) was the son of Georg Ludwig who carried on the business in his fathers name and in 1868 was appointed stockmaker to the Duke of Brunswick. His sons were Ferdinand II and Hans Wilhelm Louis who jointly ran the business under their grandfather’s name. Ferdinand was the Hofbüchsenmacher or gun maker who ran the shop and Hans Wilhelm Louis, the Kaufmann who ran the sales side of the business. Ferdinand left the business in 1916 and Hans Wilhelm Louis carried on until 1925. Ernst Rasch ( – Died in the early 1960’s) was the son of Hans Wilhelm Louis, he was the last Rasch descendent of G. L. Rasch and died without a family heir. He took over and was the sole owner of the business in 1926. The Rasch family had a farm and manor in Schapen about 7 miles from Brunswick and it was there that Ernst resided and would commute by Railway to the city to operate the business. There is still a patch of forest known as “Raschfuhren” or “Rasch’s Pines”. 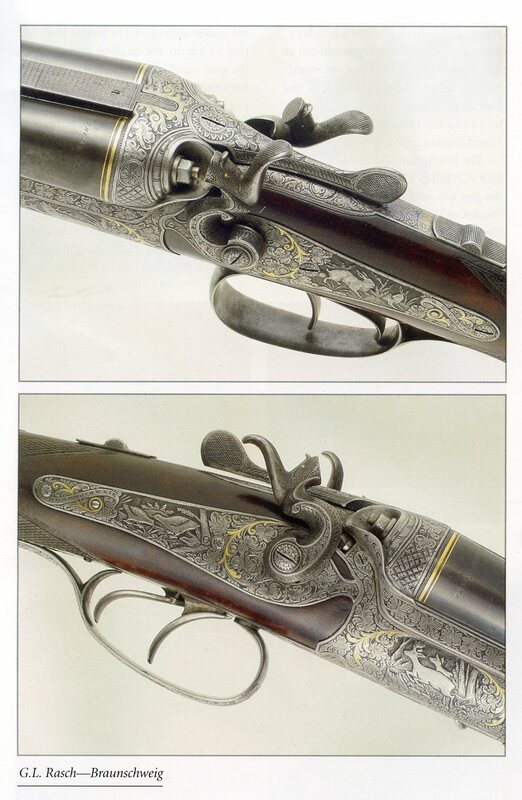 Ernst did not do much gunmaking himself and (probably) concentrated on managing the business. The shop was run by the master gunsmith Heinrich Hirsch. Prior to World War I and up to World War II the firm G. L. Rasch continued to buy guns in the white from Liege, Suhl and Zella-Mehlis. The stock making was done by Otto Anschuetz of Zella-Mehlis (there are records of 6 different Otto Anschuetz in Zella- Mehlis at this time). Engraving was contracted out to an artist in Herzberg and was often done in a pattern somewhat unique to the Rasch’s called “Raschsche Karreegravierung” or “Rasch’s squares engraving”. This pattern resembles a checkerboard or basket weave with a dot in each square. 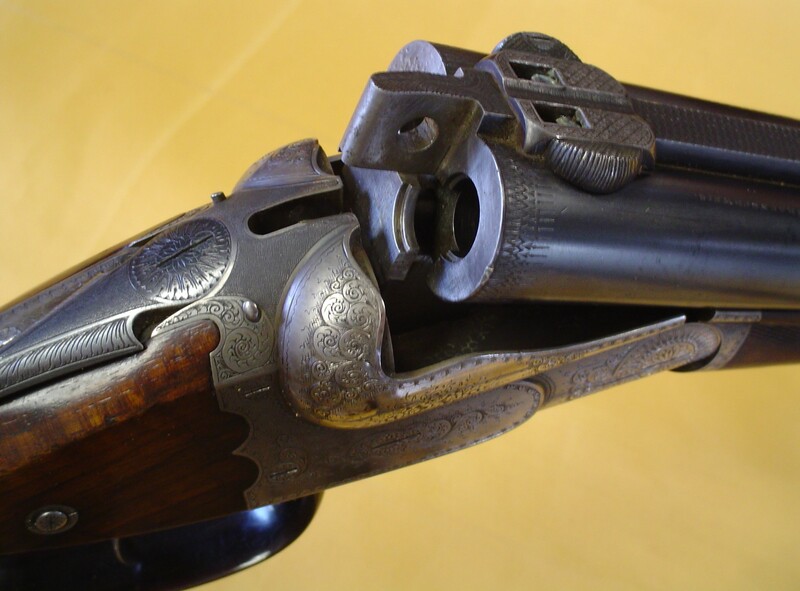 It is visible on the fences of many of the shotguns including those pictured with this story. After World War II the business of G. L. Rasch was not re-established or re-built.Heinrich Hirsch was a master gunmaker who worked for Ernst Rasch between World War I and World War II. During the war he was drafted as an Armorer even though he was of an advanced age. In 1950 he started his own gun business Waffen Hirsch in Brunswick. He died in 1966. Otto Ebert is an 85 year old master gunmaker with a home and shop at 11 Kasernenstrasse, Brunswick. He married the daughter of Heinrich Hirsch and he took over the Hirsch business and in 1968 renamed it Waffen Ebert. He continues to serve the local hunters by doing small jobs of gun repair and scope mounting. 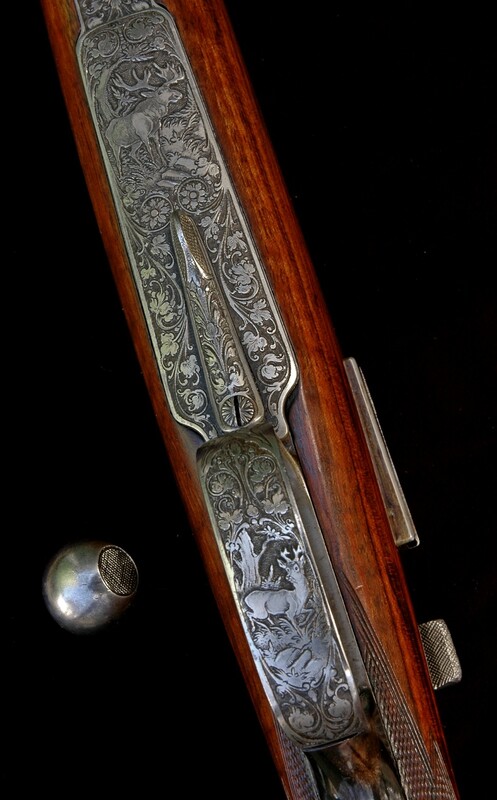 To a certain degree we can say that the gun making tradition of the Rasch family that started in the 17th Century is still being continued to this day. Sadly Herr Ebert has no descendents and when he closes his business it will be the end of that legacy. 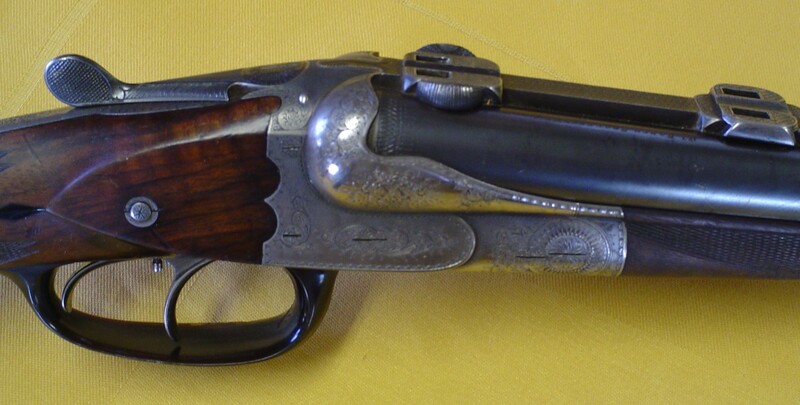 The G. L. Rasch shotgun pictured above was made in Leige, Belgium by Manufacture Liegoise d’ Armes a Feu. The Leige proof mark ELG oval without the crown shows it was black powder proofed previous to 1893. In August 1929 it was Nitro re-proofed by the Zella-Mehlis proof house. 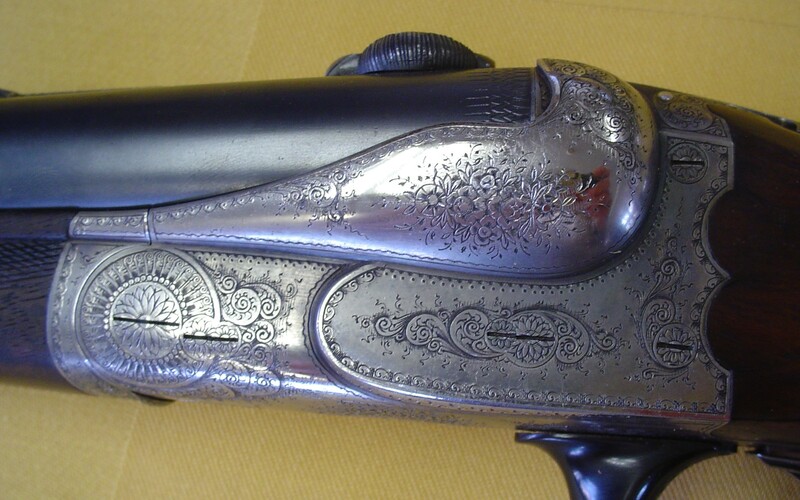 It is difficult to determine how much work the Rasch firm did on this shotgun and how much was done in Belgium. There is no question that the original owner and the Rasch’s had good taste. 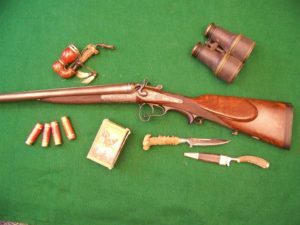 The full stock percussion rifle pictured is marked C. W. Rasch on the lock. It has the usual horn furniture and is about .55 caliber. 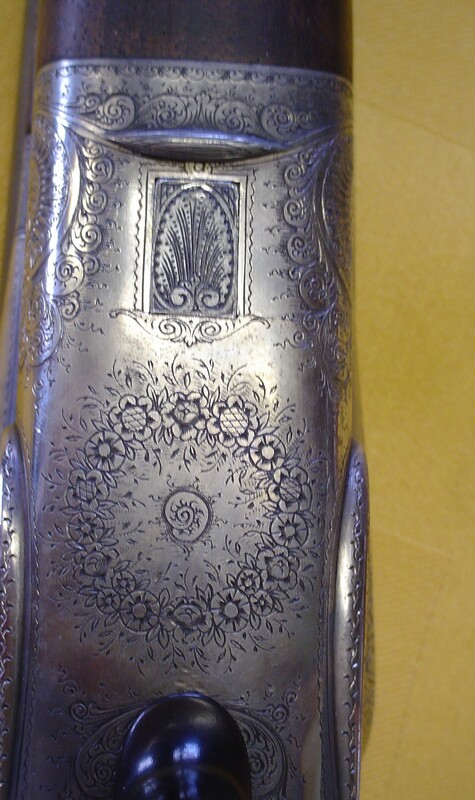 It shows a perfect balance of decoration on a rifle that was meant to be used but yet also proud of. The Rasch family of gun makers dealt in a wide range of sporting arms that included and was not limited to single and double barrel shotguns and rifles, Drillings, Single shot and repeating bolt action rifles, and target and presentation hand guns. 1893 Ad- This 1893 advertisement found in the Deutsches Jäger-Zeitung mentions the Dombrowski-Heissig Hochwildbüchsen big game rifle chambered for the Dombrowski-Heissig 14.5 x 49R or 14.5 x 55R cartridges. Heissig was a master gunsmith and teacher from Ferlach while Ernst Von Dombrowski (1862-1917) was an Austrian/ Bohemian hunting scribe well known in the late 19th Century. 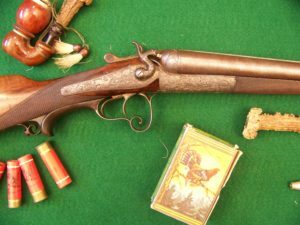 This was essentially a cartridge comparable to the .577 black powder express. Another advertisement from the Sept. 24, 1893 paper Deutsche Jäger Zeitung. 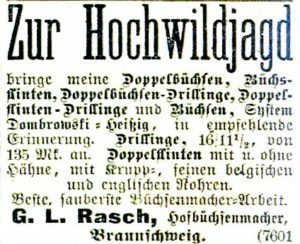 1891 Ad- This advertisement also from the Deutsches Jäger-Zeitung shows that Rasch at that date was marketing an 8mm rifle which used jacketed soft nosed bullets undoubtedly for the smokeless 8×57 cartridge. Also it mentions an establishment date of 1822 rather than the date of 1829 given by most modern references. Braunschweig Bohlweg Norden um 1880- In this picture taken in 1880 The G. L. Rasch shop at 50 Bohlweg Strasse would be just past or around the bend on the left approximately where the last pedestrians can be seen. Braunschweig Bohlweg Westseite um 1900- In this view of Bohlweg Strasse from 1900 the small street going off of Bohlweg Strasse on the right leading to the City Hall Tower is Langer Hof on which Christof Werner and Heinrich Ludwig Rasch had their shops. Below are seven images of a fantastic G. L. Rasch bolt action courtesy of Mr. Fredrik Fránzen in Sweden. 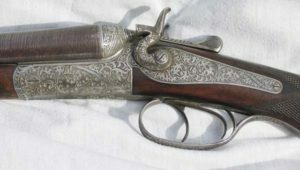 Below is a gallery of pictures of a G. L. Rasch double rifle with the Clam Shell action. 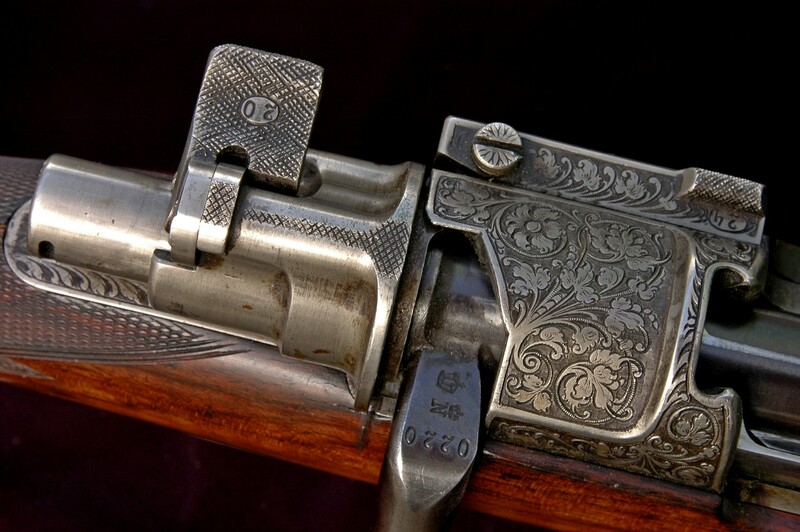 Below are several views of a bolt action rifle built on a Mauser action by G. L. Rasch.